(Malaysia and Singapore, ad-wow.com, 31 Jan 2008) Ever since the first WOW!Talk Campus back in July 2006, AdWOW! has set themselves a mission to spread on the knowledge of creative branding and how it can enhance an organisation's value. Today, a milestone has been achieved with a total of 800 professionals and students being WOWed in Singapore, Kuala Lumpur, Johor Bahru and Penang. 18 months have since passed and we have just concluded WOW!Talk 10 which saw us sharing our experiences on advertising and promotions with marketers and business professionals. WOW!Talk is part of our mission to 'arm' and enlighten the budding creative minds of the current industry requirements and trends. It also provides us with an avenue to engage and interact with the creative minds that will spearhead our industry in the not too distant future. It is our belief that we'll all benefit from a more vibrant and creative industry in the long term. It's going to be an eventful year for WOW!Talks as AdWOW! has lined up a series of WOW!Talk Pro(TM) and WOW!Talk Campus(TM). It is our vision to lift the standard and quality of creative output and to WOW! the region with creative professionals who are able to generate "creative, impressive and effective" creative branding communication solutions. Stay tuned for details on the next WOW!Talk that'll ultimately WOW your creative career and business! Malaysia (ad-wow.com, 31 Jan 2008) – The new calendar year for WOW!Talk started off on a high note with a double WOW!Talk at Han Chiang College and the Equator Academy of Art in Penang which are regarded as the two acclaimed and leading art colleges in Northern Malaysia. Addressing a combined audience of over 160 students and academics, participants were given a practical and engaging talk on "How to break into your dream creative career" by George Heng, the Managing Director of AdWOW! The participants were all ears when George shared his extensive experience and insights on how to find the right job, self-promotion skills, and how to handle interviews including pre and post-interview tips. The talk also included a Q&A session which saw many participants raising queries regarding how to break into their dream careers. All in all, these 2 WOW!Talks at the two leading art colleges in Northern Malaysia have made it possible for our budding creative talents to gain invaluable knowledge and be more prepared when taking their first step into the challenging creative industry. Singapore (ad-wow.com, 31 Jan 08) WOW!Talk has continued its strong start in 2008 with its third talk in a short span of only 7 days. This time AdWOW! was invited by the Asia Business Forum to present a paper 'Effective Advertising & Promotions Strategies' organized by the Asia Business Forum at the Marina Mandarin Hotel. This 2-day session held from 28 to 29 January provided participants with insightful and informative knowledge that could be effectively leveraged to boost sales and maximize returns on A&P expenditure. 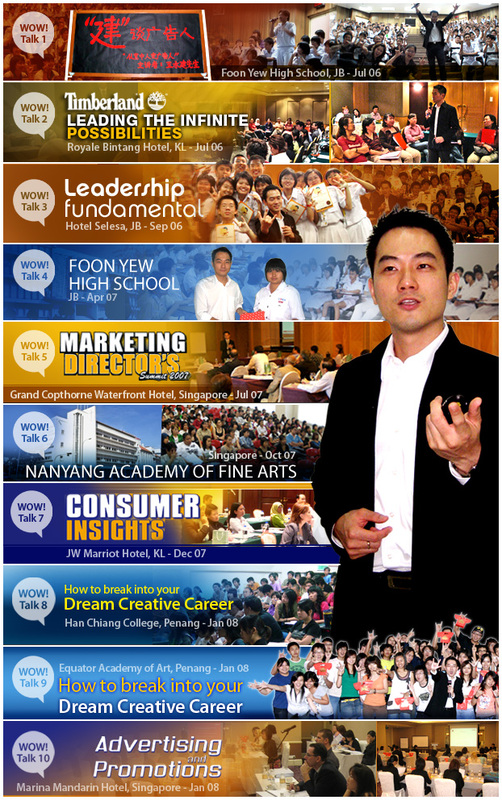 George Heng, the Managing Director of AdWOW! caught the attention of over 40 business professional and marketers with his wealth of experience on developing effective advertising and promotions activities through the formulation of high-impact creative strategies. There's more to come in this year's WOW!Talk programme, so stay tuned for more updates on talks that will just WOW your business ahead of others.